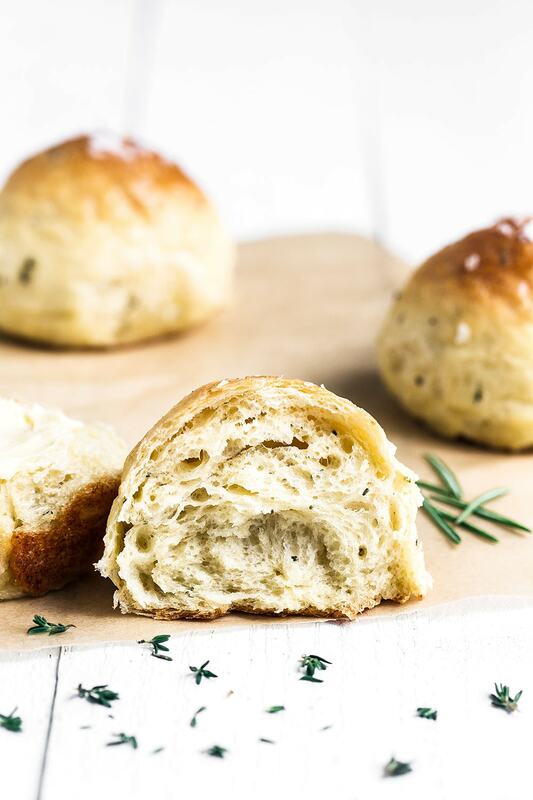 Ricotta Herb Bread Rolls are amazingly soft, tender, and pillowy in texture with tons of rich and earthy flavors. These are bound to become a family favorite! 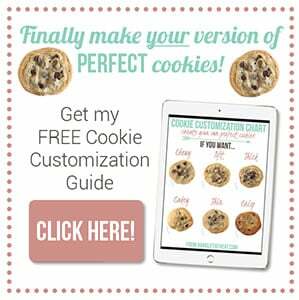 Download my Free Bread Baking Guide here! Taste: I just adore the combination of rich slightly sweet ricotta with the earthy fresh herbs. Ease: Straightforward roll recipe, and I included some instructions below for making ahead of time. Pros: Delicious twist on classic dinner rolls. Ricotta is one of my favorite ingredients that I just don’t use enough. I love to add ricotta onto pizza when ordering out. If you haven’t tried that, you absolutely must next time! Recently ricotta was on sale at the store so I stocked up to experiment with different ways to use it in baking. I recently saw a ricotta herb bruschetta at a restaurant and loved the idea of combining fresh herbs with ricotta cheese. 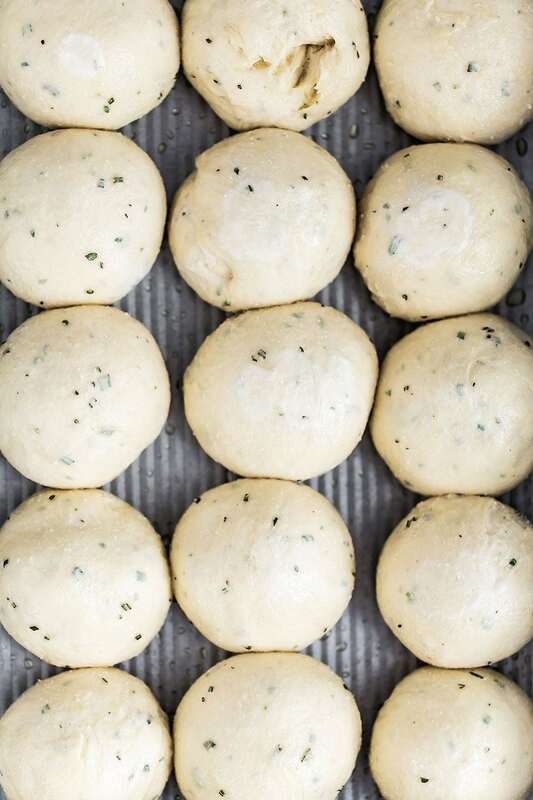 Immediately the idea for Ricotta Herb Bread Rolls popped into my mind. But I wasn’t sure if the recipe would work. I had never added a soft cheese like ricotta added straight into a bread dough and hadn’t seen it done many times in other recipes. I was worried the cheese would weigh the dough down and it wouldn’t be light and fluffy. That’s exactly what happened the first time I made these rolls. My ratios were all off and the rolls were horribly dense and dry. But I wasn’t giving up! After some more tweaking and testing I’m SO happy with the final result of this recipe. 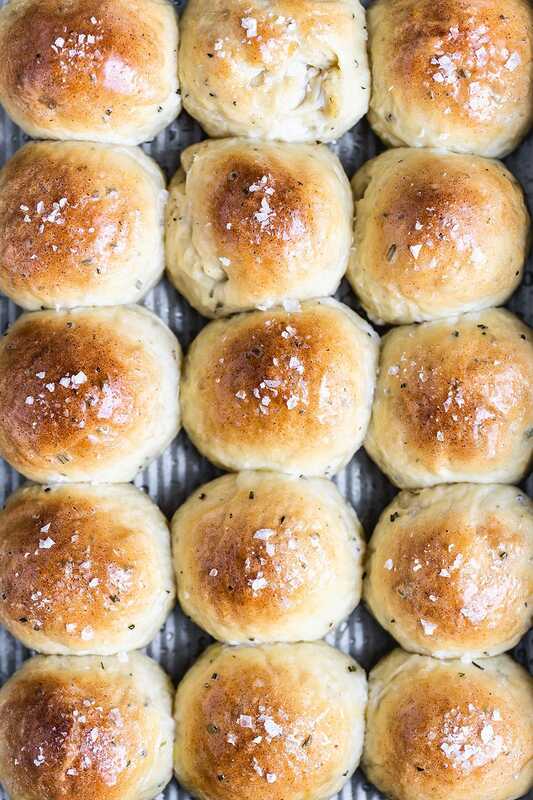 These Ricotta Herb Bread Rolls are perfectly pillowy soft like marshmallows. They’re loaded with flavor and when you smear some quality butter and sprinkle a little flaky sea salt on top… well it’s like you’re dining at an expensive restaurant! 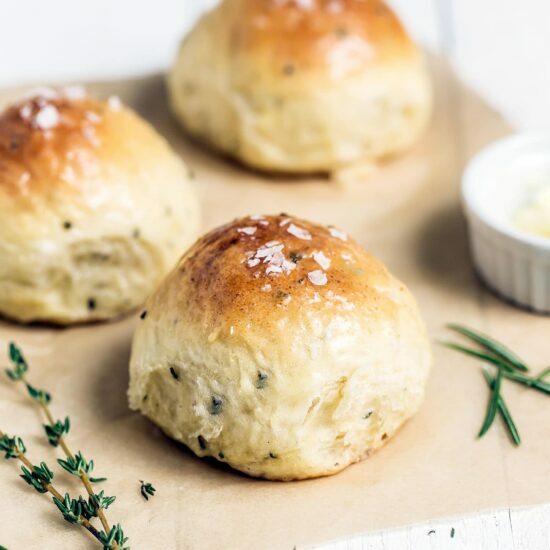 These bread rolls are bound to be a crowd pleaser for any family dinner or celebration. 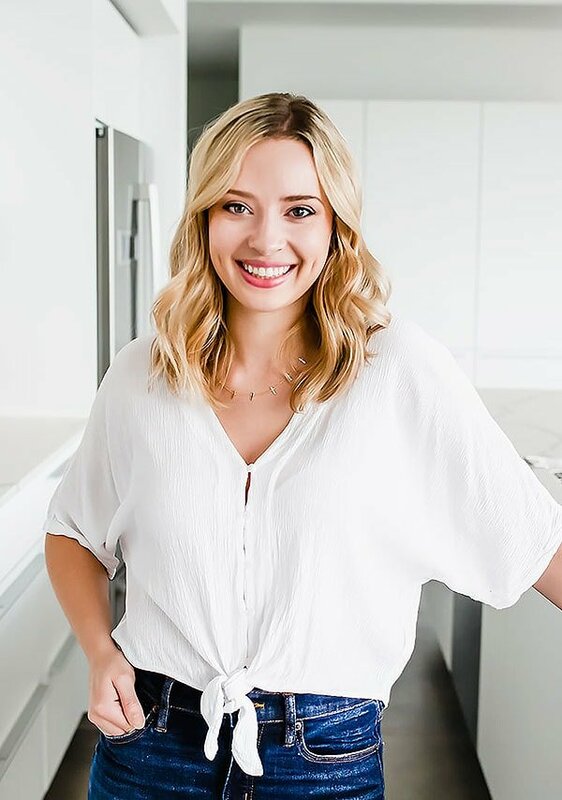 Take a peek at the recipe tips I wrote below if you’re intimidated by homemade bread baking or have a question about the recipe. 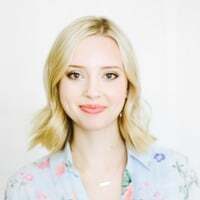 I tried to answer any you might have! You can also download my free bread guide here. If you don’t have or can’t find instant yeast, you can easily use active dry yeast instead. Simply combine it with the warm liquid called for in the recipe and allow it to proof for 5 minutes before adding into the bowl with the other ingredients. 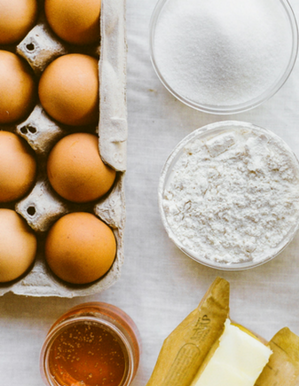 The exact amount of flour you’ll need will depend on your kitchen environment and even the brand of flour you’re using. Things like humidity and altitude can affect your dough. That’s why I give a range of flour instead of a precise measurement in this recipe. You may very well not end up using the full amount of flour. Add it in gradually just until the dough comes together. 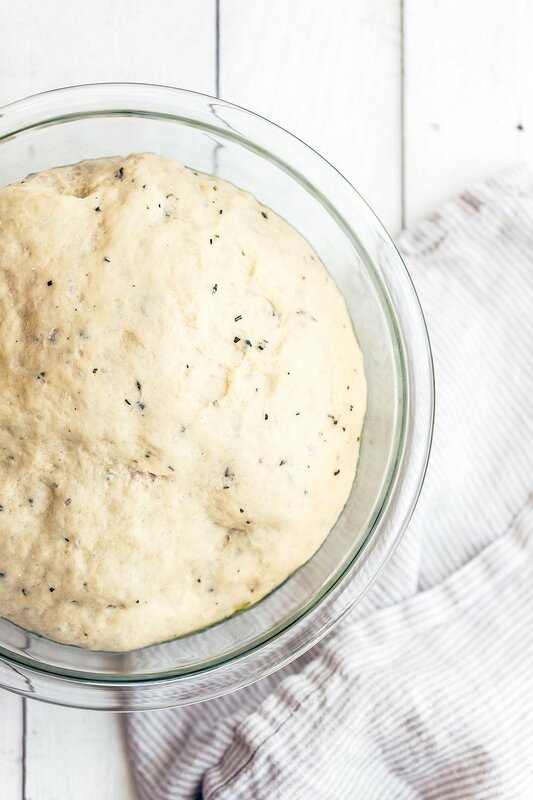 I’d always rather have a sticky dough than add too much extra flour and create dense, tough, or dry bread. As the dough rises the flour will continue to absorb extra moisture and it won’t be quite as sticky when you go to shape the rolls anyways! Use a high quality ricotta cheese in this recipe. Bring the cheese to room temperature before using. Using a stand mixer fitted with the dough hook makes easy work of kneading dough. However, if you don’t have a mixer you can knead this dough by hand. Click here to see my step-by-step video on how to knead dough perfectly by hand. The ricotta adds some richness to this dough, so it may take slightly longer to rise than other recipes do. If you’re not sure if your dough is risen, conduct the ripe test: Gently stick two fingers in the risen dough up to the second knuckle and then take them out. If the indentations remain the dough is “ripe” and ready for the next step in the recipe. If not, cover and let the dough rise longer until the indentations remain. In the bowl of a stand mixer, combine the milk, cheese, 1 tablespoon of the oil, eggs, sugar, salt, herbs, and yeast. Add 2 cups of the flour and stir with a wooden spoon until the dough forms a rough, shaggy mass. Attach the dough hook to the mixer, turn to medium-low speed, and gradually add 1 1/2 cups more flour, kneading until a mass of dough begins to forms. Continue kneading on medium-high speed for 4 to 5 minutes until a soft, smooth ball of dough is formed, adding more flour only as needed. The dough should feel elastic and slightly sticky to the touch. Avoid adding too much additional flour. Lightly coat large clean bowl with olive oil and place the dough in the bowl. Cover the bowl lightly with plastic wrap. Let rise for about 1 1/2 hours at room temperature or until the dough is big, puffy, and about doubled in size. Spray a 13×9-inch baking pan with cooking spray. Gently deflate the dough. Use a bench scraper, knife, or pizza wheel to divide the dough into 15 equal pieces. Shape each piece into a ball and place in the prepared pan. Brush with the remaining 1 tablespoon of olive oil and sprinkle generously with flake sea salt. Lightly cover the dough with plastic wrap and let the rolls rise for 45 minutes, or until about doubled in size. MAKE AHEAD: At this point the shaped rolls can be covered and allowed to rise in the fridge overnight. Bring to room temperature before baking. Bake the rolls for 25 minutes, or until golden brown. Serve warm. Store leftovers in a plastic bag for up to 3 days. Tessa, these lol so amazing that I have to try them, even though I’ll need to use a gluten free flour mix. I already crave them. I’m wondering if I can freeze them after shaping and before baking.. so I can cook only 3 or 4 at a time and eat them fresh out if the oven. Like I do your cookies ☺️❤️ I roll the dough in logs and freeze so I can cut off however many cookies we want to eat during movie time. I freeze some of your bar recipes after cooking, for the same reason, just thaw 2 or 3 and have a late night treat. I’ve had good success converting to gluten free, but bread rolls will be a new try. Thank you for such wonderful recipes. Dear Tessa, I would love to make these. I have a question though. What is “part skin” ricotta? Is it reduced fat ricotta? Could I use full fat? This looks really good, but I only ended up using two cups of flour and the bread was already really heavy. I’m not sure if that’s correct. Good recipe. Makes rich, moist, and dense bread. Used dry herbs because I could not get fresh at that time. I tried making in rolls as well as in a loaf (baked 45 min for a loaf). Both worked great!